I recently got a Sony A7R II camera, to replace my Panasonic GH2. I also got the 55mm prime and the 24-70mm zoom lenses. It’s a great camera, and I’m still learning the ins and outs of it. One really nice feature of the camera is EYE AF, the ability to focus automatically on someone’s eyes. It works surprisingly well, and is a great feature especially if you have young children (who aren’t so keen on staying in one spot for very long). You can tell when the camera has locked onto someone’s eyes because it’ll draw little green boxes around the eyes. Eye AF is great, but the way it’s implemented is a little quirky. With the default configuration of the camera, you must first half press the shutter button to focus the camera (as you would normally), then you have to press and hold the center button of the control wheel to activate the Eye AF (while still half pressing the shutter button). This is awkward, to say the least. I have reconfigured my camera to make things easier. I now use back button focus, tied to the AEL button. Also, I have configured the AF/MF/AEL switch level to toggle between normal AF and Eye AF. So now, to focus the camera, I hold down the AEL button, and then use the shutter to take the photo. Depending on which position the AF/MF/AEL toggle is in, when focusing I’ll either be in normal AF or Eye AF. I don’t have to hold down two buttons at once for focus, and I can quickly switch autofocus modes. It’s also important to note that for Eye AF to work, the camera must be in AF-C (continuous autofocus) mode. Also, here’s the Sony Help Guide for the A7RII. My wife and I take a lot of photos and we’ve been searching for a system where we could combine and manage our various pictures. I had been using Adobe Lightroom to manage my photos and she had been using Apple’s Aperture. We wanted one system where we could access, catalog, manage, develop and print our photos. We decided to standardize on Lightroom , but Lightroom is currently single-user only. We needed to be able to access our Lightroom catalog from multiple computers and Lightroom’s SQLite-based database is not designed for that. So after some research, I put together the following system. It allows us to use one Lightroom catalog on multiple computers. The caveat is that only one of us can be running Lightroom at a time. Other than that, it solves our problem. WARNING: This is a hack. While it works for us, I do not guarantee that this will not trash your Lightroom catalog. Make backups and proceed carefully. SECOND WARNING: These directions and the script are not polished. This post assumes some technical savvy. There are a couple parts to my solution. It requires a network share on a NAS and it requires a service like Dropbox, that syncs a set of files across multiple computers. Some NAS devices come with software that provides Dropbox-like functionality. The NAS I have, a Synology DS412+ , has software, called CloudStation, which provides this functionality. Also, we’re a Apple Mac-based household. This solution should work for Windows as well, but you will have to customize the shell script. In short, we store our photos on the NAS and we store the Lightroom catalog on the Dropbox folder. We invoke Lightroom using a shell script that ensures that only one person can run Lightroom at a time. The reason we put the Lightroom catalog in a Dropbox folder is for speed; the catalog and previews are stored locally. Many people already store their photos on a NAS. If you are not currently doing so, there are several tutorials to help you migrate your photos, such as this one. To begin, make sure you’re not running Lightroom. Locate the Lightroom catalog, which is usually stored in your Pictures folder. You’re looking for the ‘Lightroom 5 Catalog.lrcat’ and ‘Lightroom 5 Catalog Previews.lrdata’ files. Copy these to a folder in your Dropbox, and then rename the old ones so that Lightroom doesn’t try to use them in the future. When you next launch Lightroom, it will ask you for the catalog file; point it to the one in your Dropbox folder. The ‘Lightroom 5 Catalog Previews.lrdata’ file is a cache of previews of your photos. It can be large, but can be regenerated at any time. I choose to not have Dropbox/CloudStation sync that across the various computers, and let each computer generate it when Lightroom is run. Dropbox and CloudStation both have selective sync functions that allow you to exclude files/folders from syncing; that’s how I do that. Now you should have a normally working Lightroom installation, with your photos on the network share on the NAS and your catalog in the Dropbox folder. The last bit of the solution is to only run Lightroom through the use of the following shell script, which I’ll explain. It makes sure the network share containing the photos is mounted. On the network share, it looks for a time file that was created by a previous instance of running the shell script, and indicates the last time the script (and Lightroom) were run. If the file exists, it checks the time and makes sure it’s been at least 15 seconds since the last run. This is to allow Dropbox time to synchronize the catalog from any other computer. The 15 seconds is a guess on my part; you may want to make it longer. Once it’s been at least 15 seconds, the script attempts to create a lock directory on the network share. This only succeeds if the lock directory doesn’t already exist. If it exists, the script assumes that someone else is running Lightroom and displays an error message. One the lock directory is created, it launches Lightroom and then waits for Lightroom to close. Once Lightroom closes, it removes the lock directory and updates/creates the time file. The script assumes your network share is mounted at /Volumes/home and that there is a Lightroom directory there. This does not have to be where your photos are stored. To run the script, I used Platypus to create a Mac application out of the shell script. I placed the resulting app, which I call ‘RunLightroom’, on the network share, and then on each computer I dragged that to the Dock, to make it easy to run. Hopefully this helps someone else out. Family photo sharing/management is a huge opportunity that Adobe should probably own (for better or worse). This post only addresses part of the problem; another issue is access to your photos on all your devices. Synology has a solution for that and I’m working on integrating that with Lightroom. I’ll put up another post when/if I have that figured out. Please let me know if you have suggestions for improving this post; this is just a first draft and these instructions are admittedly pretty rough. This past summer we vacationed in Scandinavia, visiting Norway, Sweden and Russia. This photo was taken as we travelled by ferry from Oslo to Balestrand, Norway. I’ve been on safari in Africa twice; the first time was our honeymoon in 2011. We had such an amazing time that we decided our next trip would be another safari, and so we went again this past June. And we knew even before we returned, that it won’t be our last safari. I’ve posted some of the photos I took on those trips here on the blog and several adorn our house. For Christmas, my in-laws got me The Centre Cannot Hold , a book by David Gulden, of black and white images taken in Africa of (mostly) animals. David’s goal was to take photos that no one else had been able to capture. This entailed using such devices as an infrared-triggered camera, and going to such lengths as using a cross-bow to mount a camera near an eagle’s nest. His effort was worth it. The images are stunning, and not just because of his MacGyver ways. The man clearly has a talent. The result is a great coffee-table book. And for this newbie photographer, the photos are an inspiration. Until I went on safari last year, the best camera I had was a Canon point and shoot. I knew I wanted a better camera for the trip, so I started researching DSLRs. I had a few concerns however. One was size and weight. We were going to be traveling in small planes and we had strict weight limits on our luggage. Also, I wanted a camera that I would feel comfortable ‘walking around’ with, and I wasn’t sure that’d be the case if I got a big DSLR. And I wasn’t crazy about spending several thousands of dollars, especially since I was just beginning. My research quickly took me in the direction of Micro Four-Thirds cameras. M4/3s is a standard for cameras and lenses that’s currently supported by Panasonic and Olympus (plus some additional lens makers). M4/3s cameras are smaller than traditional DSLRs because they’re mirror-less. A traditional DSLR has a mirror inside that directs the light to the viewfinder when focusing. When the shutter is pressed, the mirror swings out of the way exposing the sensor. This takes a lot of room and requires a large camera body. M4/3s cameras do away with the mirror by using an electronic viewfinder. Another factor is lens size. M4/3s cameras have smaller sensors than larger DSLRs. This means that the lenses can be smaller. For example, a 20MM M4/3s lens is equivalent to a 40MM full-frame lens. Besides size, M4/3s cameras have another advantage; it’s a standard supported by multiple camera makers. Unlike Canon, Nikon and the other traditional DSLR manufacturers, who each have their own incompatible standards, a camera body by Panasonic will work with a lens by Olympus (and vice versa). It greatly appeals to me to have a camera/set of lenses that are supported by multiple major manufacturers. On deciding that I was interested in a M4/3s camera, I had to pick which one to buy. The Panasonic GH2 had just come out and was receiving great reviews. It was smaller than a normal DSLR, but not as small as a point and shoot. It’d fit in my hand well. I was also interested in video, and the GH2 does great video. It is true that the best M4/3s cameras don’t yet equal the best in DSLRs, although the quality gap is shrinking. And actually, many people think that the video capabilities of the Panasonic GH2 are as good as or better than the new Canon 5D Mark III, a camera that costs over $2000 more and is considerably larger in size, especially when you factor in the lenses. In my experience, the quality of the GH2 has been more than good enough for my experience level and types of pictures I like to take. I’m happy with my GH2. It’s the right size for me. I’m confident that because multiple manufacturers support the standard that my lenses will be useful for many years to come, even as I upgrade camera bodies. As we plan our next safari, I look forward to taking it back to Africa. I recently purchased my first serious photo printer, an Epson Stylus Pro 3880. While the vast majority of the pictures I take will only be viewed on a computer monitor, there’s just something about holding a print of a photo you’ve taken. I considered several printers before purchasing the Epson. The two other main contenders were the Canon PixmaPRO9000 Mark II and the Canon PixmaPRO9500 Mark II. They all appear to be great printers; in the end I went with the Epson because it can print up to 17″ wide. By the way, there are great deals on the Canon 9000 right now because it’s being bundled with some cameras. People are unloading these bundled printers on Craigslist and eBay for quite a discount. Also, Epson is running a $250 rebate for the 3880 that lasts through the end of this month. Go to their website for more information. So now that I have a printer, I’m trying to learn how to make decent prints. And I’ve found there are a lot of variables. An eBook that’s helping me figure things out is Martin Bailey’s Making The Print. One of the big variables is the type of paper a photo is printed on. I ordered sample papers from both Red River Paper and Hahnemühle and have been making test prints, as you can see below. It’s been fun but a bit overwhelming, with all the different paper possibilities. 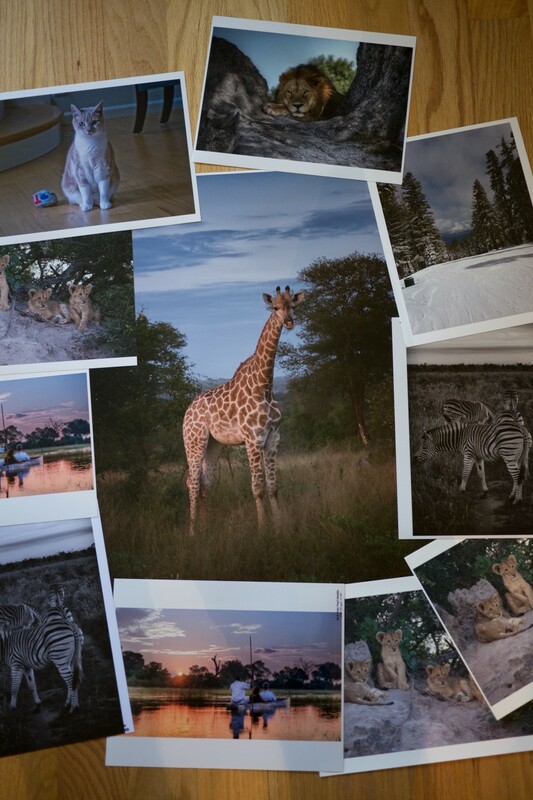 The giraffe photo, btw, is on one of the big 17″ x 22″ sheets that the Epson can print. I’m happy I went with the larger printer as the big prints are really stunning. I’m really enjoying my new iPad. One of the first things I do when I get a new computer is change the wallpaper. 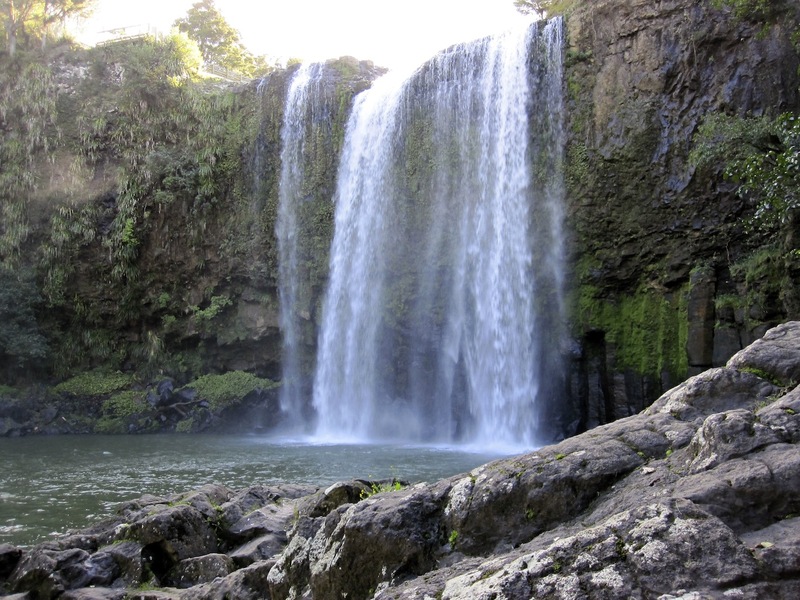 This picture is one I took of Whangarei Falls, on the north island of New Zealand, last spring. I’m biased, but I think it makes an excellent iPad wallpaper (ping me if you’d like a copy of the original, full-resolution version). Continuing my experiments with iPhone panoramas (and risking turning this blog into just a photo-blog), this was stitched together using Photoshop CS3 from three pictures I took this weekend. I’m not terribly happy with the colors, but I’m a bit limited with the iPhone. Every spring, the county brings in this herd of goats to munch on the grass across from my house. The furry lawnmowers devour a prodigious amount of grass every day, and they make quick work of the area. 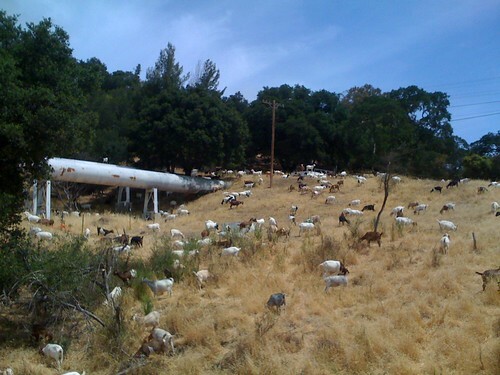 It’s difficult to see in this picture, but there’s a goat walking across the pipe. This group is about half of the goats working the hill. When they’re all concentrated in a smaller area, it looks like a sea of fur and horns. I’ve been experimenting with panoramas over the past few months, with varying degrees of success. Panoramas are multiple pictures of a given scene, from different views, combined into one larger, (hopefully) coherent, image. Since I’m only using my iPhone, the individual source pictures aren’t that great (fingers crossed that iPhone 2.0 has a better camera), but I like the results. 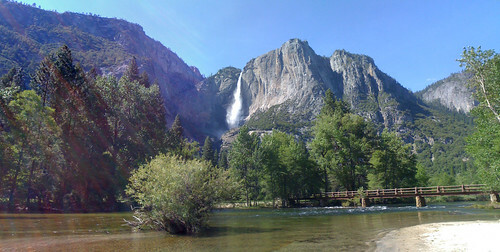 I’m using Calico to assemble the panoramas, and I think it does a good job. One of the challenges is adjusting the exposure/colors of the individual pictures. Calico does some of that automatically, but as you can see in these, there’s still some variation. A second challenge is getting enough ‘coverage’ of the scene. As you can see in these panoramas, there are some black spots indicating where I didn’t get enough coverage (ie. take a picture). Click through each picture to Flickr for other sizes.